If a hammer is your only tool, every problem tends to look like a nail. So says Maslow’s law of the instrument, cautioning that while a tool may be useful, it can also limit perception in ways that reduce future options.1 In today’s world, financial accounting has become this type of hammer. It implicitly and explicitly constrains how we approach resource allocation and policy decisions, because it privileges a single type of resource—money.2 Yet many other types of resources exist, such as intangible assets like knowledge, relationships, and reputation. Intangible resources currently comprise over 80 percent of the S&P 500’s market value.3 They are also essential ingredients for value creation in the public and nonprofit sectors. However, decision making for large government projects generally neglects intangible resources, instead mandating financially focused analytics, such as cost-benefit analyses geared toward efficiency and cost-effectiveness. While this approach is useful when the primary goal is to preserve financial resources, a singular focus on financial assets often leads to underinvestment in intangible resources essential to long-term success and adaptation. If we are not attuned to them, it can be easy to overlook resources that are more difficult to see and quantify, such as equity, quality, timeliness, and positive social impacts on the community. 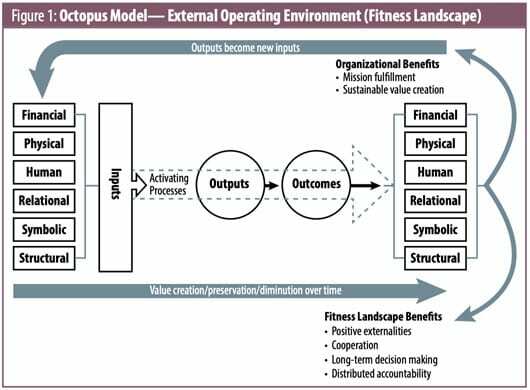 Many readers will recognize the octopus model as being similar to logic models used in the nonprofit sector. An advantage of this graphic depiction is that it makes noneconomic impacts—what economists typically call externalities—explicit.23 This is important, because the fundamental task of nonprofits is to create positive spillover effects (i.e., public benefits), yet external stakeholders can be unclear on the relationship between outputs, outcomes, and impact. 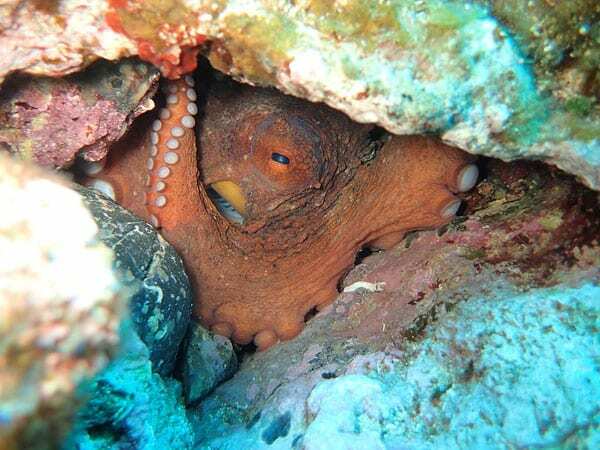 The Integrated Reporting “octopus” makes it easier to tell and understand this story. After becoming familiar with the framework, it will be helpful to inventory your organization’s tangible and intangible resources, such as employee engagement, leadership, and collaborative networks. Then, as a group, identify the top three or four value drivers that are most relevant to your organization. In figuring these out, you are likely to identify some of the assumptions and values beneath these priorities. Be sure to think across multiple levels—the capitals can be developed at the individual (e.g., employees, volunteers, people you serve), team, organization, network, and community levels. As you dig deeper, you will probably surface a few key performance indicators for the various forms of capital that you will want to track at each level. Talk to program staff to see if these metrics are meaningful, and discuss with other stakeholders to see if they ring true for them, too. Often, you may wish to combine measures: financial (revenues, costs, financial statements); quantitative (metrics that can be counted, e.g., energy usage); and qualitative (analysis, descriptions, stories, icons). Look at capacity-building indicators and translate them into multiple capitals language.3 Develop an octopus model for your department and then your organization, looking for linkages between them. After these initial explorations, consider developing target milestones and timelines to expand the discussion more widely in your organization. Mary Emery, Susan Fey, and Cornelia Flora, “Using Community Capitals to Develop Assets for Positive Community Change,” CDP Practice 13 (2006): 2–19. Ashley E. Anglin, “Facilitating community change: The Community Capitals Framework, its relevance to community psychology practice, and its application in a Georgia community,” Global Journal of Community Psychology Practice 6, no. 2 (October 15, 2015): 1–15. Gary A. Goreham et al., Successful Disaster Recovery Using the Community Capitals Framework: Report to the North Central Regional Center for Rural Development (East Lansing, MI: USDA/North Central Regional Center for Rural Development, Michigan State University, May 31, 2017). Stephani Etheridge Woodson, Theatre for Youth Third Space: Performance, Democracy, and Community Cultural Development (Chicago: Intellect, The University of Chicago Press, 2015). See, for example, Nikki Ritchie, “A five-step guide to kick starting Integrated Reporting,” Integrated Reporting (IR), January 23, 2015; and Implementing Integrated Reporting (London: PricewaterhouseCoopers LLP, July 2015). See also Preparing an Integrated Report: A Starter’s Guide (Updated) (Johannesburg: Integrated Reporting Committee [IRC] of South Africa, 2018). See, for example, Bernard Marr, Future Value Drivers: Leveraging Your Intangible Assets Using a Five-Step Process (Canada: Chartered Professional Accountants Canada, 2018). Capacity Development Group, Bureau for Development Policy, Measuring Capacities: An Illustrative Catalogue to Benchmarks and Indicators (New York: United Nations Development Programme, September 2005). Collectively, these multiple capitals can be used to frame key dimensions of organizational effectiveness and sustainability, building on Laurie Mook’s integrated framework for social accounting.27 An example is WealthWorks, a multiple capitals approach—funded, originally, by the Ford Foundation, to “improve livelihoods and upward mobility for people, places and firms within a region.”28 Its success stories include a group of African-American farmers in Mississippi and Alabama, who reignited farming as a path to individual and community prosperity by coming together to learn organic practices—in turn, generating access to new and larger markets. In its first two years, thirty-five growers—whose farms previously had each earned less than $2,500—generated over $266,000 in sales of vegetables to schools, high-end restaurants, grocery stores, and wholesale buyers.29 The forms of capital WealthWorks tracks include intellectual (sustainable production practices, universal growing protocols), social (collaborative networks, relationships between farmers and wholesale customers), political (policy engagement), financial ($640,000 in new capital investments), and human (improved business skills and certifications for farmers). Key to this model is recognizing networks as value chains that can generate and convert different forms of capital, some of which ultimately can be monetized. A fundamental aspect of this conversion process is the development and transformation of forms of capital across multiple levels (individual, organizational, networks, community). This indirect flow—called roundaboutness by the nineteenth-century economist Eugen von Böhm-Bawerk—is important, because it explains how micro-level investments (e.g., a child’s preschool education) can produce emergent macro-level benefits over time—what economists call increasing returns.30 Thus, it offers a path to escape the false logic of efficiency and the nonprofit starvation cycle by providing a rationale and strategy to invest in intangible value creation drivers. From a management perspective, Integrated Reporting is a way to align strategy, planning, performance, accountability, and reporting while developing a new collective understanding of how an organization creates value over time. Because this process is collaborative, it offers a means to illuminate multiple perspectives, surface assumptions, promote shared meaning making, and develop more expansive understanding of complex issues. Best practices of Integrated Reporting encourage the articulation of connectivity: how the capitals, stakeholders, business model, risks, and trade-offs interrelate; how organizational objectives, strategy, and operations are affected by resource dependencies, stakeholder expectations, and the operating context; how internal policies, systems, and processes support organizational objectives; and how past performance positions the organization for future success. An Integrated Reporting framework can be used for many purposes, including program planning and outcome reporting, organizational reporting to stakeholders, and developing shared understanding of how communities deal with change. It offers a new vocabulary (multiple capitals) with which to speak to funders, government officials, people we serve, and other stakeholders. What we call capacity building is really about capital building. Integrated Reporting’s multiple capitals framework is a way to make the human foundation explicit by giving representation to the tangible and intangible resources that people, organizations, and communities produce and require to thrive. Additionally, a fundamental role of the nonprofit sector is to promote prosocial and democratic norms. Integrated Reporting offers a way to take up and publicize this role in a more explicit way. Its value creation logic shines a light on the wisdom of investing in intangible resources that are, in fact, the soil from which economic prosperity and well-being spring. By adopting Integrated Reporting, the nonprofit sector also makes explicit concepts that apply to all organizations in any sector, namely, the social contract, social legitimacy, and social license—thus promoting norms of reciprocity and mutual value creation instead of a narrow focus on value extraction. Integrated Reporting is increasingly used in Europe, Australia, and Asia to help organizations and governments tell their value creation story. Why? Because over the past forty years, economists and investors have come to realize that intangible resources are now the primary drivers of value creation for organizations and society.32 The “Big Four” accounting firms (Deloitte, Ernst & Young, KPMG, and PwC) have each published papers advocating for the use of Integrated Reporting.33 Integrated Reporting is being used in all sectors—private, public, and nonprofit/ NGO—because it promotes transparency, better decision making, and relational accountability (voluntarily holding oneself accountable to maintain integrity, trust, and social norms that make sustained commercial exchange possible). Research suggests that we have fundamentally misunderstood the economy by disregarding intangible resources.34 This has led to the decoupling of synergistic interactions needed to produce emergent, long-term benefits (e.g., social cohesion and human flourishing). Rather than economizing practices—for example, efficiency, control, and growth—a sustainable economy requires an ecologizing approach: “symbiotic, integrative linkages between organizations and their environments that function adaptively to sustain life in communities.”35 To nurture these linkages, we need to recognize and measure what matters. Integrated Reporting is an actionable path to begin counting what counts. The concept behind Maslow’s law of the instrument is attributed to Abraham Maslow and Abraham Kaplan. Frank Ackerman and Lisa Heinzerling, “Pricing the Priceless: Cost-Benefit Analysis of Environmental Protection,” University of Pennsylvania Law Review 150, no. 5 (May 2002): 1553–84. Barry Libert and Megan Beck, “Most Leaders Fail At Capital Allocation,” Forbes, October 8, 2017. For more on the nonprofit starvation cycle, see Keenan Wellar, “About Nonprofit Waste, Overhead, and Financial Subservience,” Nonprofit Quarterly, September 21, 2018. Paul Gompers et al., “How Do Venture Capitalists Make Decisions?,” NBER Working Paper Series No. 22587 (Cambridge, MA: National Bureau of Economic Research, September 2016). Rounds Consulting Group, Policy Review: An Economic and Policy Examination of College Tuition Subsidy Proposals (Phoenix: Arizona Chamber Foundation, September 2018), 16. The next highest was Louisiana, at -40.6%. Daniel Perle, “Report: Arizona saw biggest post-recession tuition increases in the U.S.,” azcentral, October 18, 2018; and Michael Mitchell et al., Unkept Promises: State Cuts to Higher Education Threaten Access and Equity (Washington, DC: Center on Budget and Policy Priorities, October 4, 2018). Tom Mortenson, California at the Edge of a Cliff: The Failure to Invest in Public Higher Education is Crushing the Economy and Crippling Our Kids’ Future (Sacramento: California Faculty Association, January 7, 2009). John Brennan, Niccolo Durazzi, and Séné Tanguy, “Things we know and don’t know about the wider benefits of higher education: A review of the recent literature,” BIS Research Paper Number 133 (London: Department for Business Innovation & Skills, London School of Economics and Political Science, 2013). See, for instance, “Investing in Single Mothers’ Higher Education,” Institute for Women’s Policy Research website. Robert Eccles, Ioannis Ioannou, and George Serafeim, “Is sustainability now the key to corporate success?,” Guardian, January 6, 2012; and “About GRI,” GRI (Global Reporting Initiative) website, accessed September 30, 2018. Laurie Mook, “An Integrated Social Accounting Model for Nonprofit Organizations,” in Accountability and Social Accounting for Social and Non-Profit Organizations, Advances in Public Interest Accounting 17, ed. Ericka Costa, Lee D. Parker, and Michelle Andreaus (Bingley, UK: Emerald Publishing, 2014): 197–221. “Get to grips with the six capitals,” Integrated Reporting (IR) website, accessed September 27, 2018. Leigh Georgia Roberts, “ICYMI | Integrated Reporting: The South African Experience,” CPA Journal, July 2017; and Klaus Schwab, The Global Competitiveness Report, 2016–2017 (Geneva, Switzerland: World Economic Forum, 2016). “FAQ: The Octopus Model,” Integrated Reporting Committee of South Africa website, accessed November 2, 2018. Elizabeth A. Castillo, “Spinning Straw into Gold: A Case Study of Resource Creation, Flow, and Conversion in a Nonprofit Collaboration,” PhD diss., San Diego University, 2016, 219. Structural capital is “the ‘binding’ of time-space in social systems” (social theorist Anthony Giddens). This illuminates that we have choices in how we structure organizations and societies (e.g., hierarchies, networks, matrix) and rules (democracy, autocracy, oligarchy, etc.). The IIRC’s model was developed primarily by accountants and management professionals, whose training likely did not include sociology. From an equity standpoint, this is problematic, because who gets to make the rules and sit at the table for rule making is key to power, since that is who determines the structure of the economic system (e.g., what counts). Using a typology that includes symbolic and structural capitals (e.g., rule of law/governance) illuminates these power levers. For a description of the concept of externalities, see Bryan Caplan, “Externalities,” The Library of Economics and Liberty, accessed October 22, 2018. Elizabeth A. Castillo, “Beyond the Balance Sheet: Teaching Capacity Building as Capital Building,” Journal of Nonprofit Education and Leadership 6, no. 3 (July 2016): 287–303. 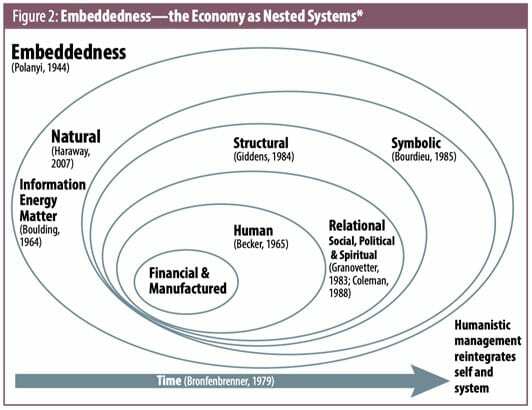 For more on “embeddedness,” see Karl Polanyi, The Great Transformation: The Political and Economic Origins of Our Time, (New York: Farrar and Rinehart, 1994). Paul D. Hirsch, “A Framework for Integrative Thinking about Complex Problems,” Conflict and Collaboration (blog), June 25, 2012. Mook, “An Integrated Social Accounting Model for Nonprofit Organizations.” See also Daniela Mattos, “Community Capitals Framework as a Measure of Community Development,” Cornhusker Economics, Institute of Agriculture and Natural Resources, University of Nebraska-Lincoln, September 2, 2015; Yvonne (Bonnie) Wichtner-Zoia, “What are community capitals?,” Michigan State University Extension, December 20, 2013; and OECD Better Life Initiative: Compendium of OECD well-being indicators (Paris: Organisation for Economic Co-operation and Development, 2011). “Construct a WealthWorks Value Chain,” The Basics, WealthWorks, accessed October 8, 2018. “Deep South Community Agriculture: Back to the future: Food, farms and renewal,” Success Stories, WealthWorks, accessed October 8, 2018. Liberty, “Roundabout Methods of Production,” Economics for Real People (blog), Mises Institute, July 23, 2012. Dimitar Vlahov, “3 #NewMetrics Trends Every Business Should Follow,” New Metrics (blog), Sustainable Brands, July 16, 2018. A new OECD project: New sources of growth: intangible assets (Paris: Organisation for Economic Co-operation and Development, September 2011). See, for example: “Integrated Reporting: a driver for Integrated Thinking,” Deloitte, accessed September 30, 2018. See also “Integrated Reporting,” Deloitte, accessed November 6, 2018; Integrated Reporting: Elevating value (Australia: EYGM, 2014); “Integrated Reporting—Closing the reporting gap,” KPMG, December 1, 2016; and Implementing Integrated Reporting (London: PricewaterhouseCoopers LLP, July 2015). Baruch Lev, Intangibles: Management, Measurement, and Reporting (Washington, DC: Brookings Institution Press, 2001). Diane L. Swanson, “Toward an Integrative Theory of Business and Society: A Research Strategy for Corporate Social Performance,” Academy of Management Review 24, no. 3 (July 1999): 517. *The sources informing the concepts in Figure 2 are, in alphabetical order: Gary S. Becker, “A Theory of the Allocation of Time,” Economic Journal 75, no. 299 (September 1965): 493–517; Kenneth E. Boulding, The Meaning of the Twentieth Century: The Great Transition (New York: HarperCollins, 1964) Pierre Bourdieu, “The market of symbolic goods,” Poetics 14, no. 1–2 (April 1985): 13–44; Urie Bronfenbrenner, The Ecology of Human Development: Experiments by Nature and Design (Cambridge, MA: Harvard University Press, 1979); James S. Coleman, “Social Capital in the Creation of Human Capital,” American Journal of Sociology 94 (1988): S95-S120; Anthony Giddens, The Constitution of Society: Outline of the Theory of Structuration (Berkeley and Los Angeles: University of California Press, 1984); Mark Granovetter, “The Strength of Weak Ties: A Network Theory Revisited,” Sociological Theory 1 (1983): 201–33; Donna J. Haraway, When Species Meet (Minneapolis: University of Minnesota Press, 2007); and Karl Polanyi, The Great Transformation: The Political and Economic Origins of Our Time (New York: Farrar and Rinehart, 1994). Dr. Elizabeth Castillo is an Assistant Professor of Leadership and Interdisciplinary Studies at Arizona State University. She studies organizational leadership through the lens of complex adaptive systems. Her current research investigates capitalization of organizations, particularly how intangible assets like social, cultural, and political capital contribute to the production of social and financial returns. Her scholarship is inspired by two decades of management experience in the nonprofit sector, including the San Diego Natural History Museum and Balboa Park Cultural Partnership. Her mission is to repair the world through research that promotes thriving organizations, engaged employees, connected communities, and a world we can be proud to pass on to our children.